Order Genuine Original Brother HL3140/3170 Hy Yellow Toner TN225Y (TN-225Y) and keep your Brother TN225Y, TN-225Y Working Perfectly. 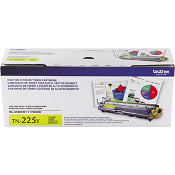 The Brother HL3140/3170 Hy Yellow Toner TN225Y (TN-225Y) is in stock and ready to ship. We ship from many distribution warehouses across the country to get you your TN225Y, TN-225Y as quickly as possible. At USA Imaging Supplies, We work For you!